Does Synagogue Have To Be So Boring? I’m engaged to a Jewish woman who I have been dating for seven years. I’ve observed a lot of holidays over the years with her and her family and I love every minute of it. I’m even in charge of matzo ball soup now at Passover. Last year she said I might try coming to synagogue with her more often. There is no expectation for me to convert, but she just wants me to get used to it since we will be married by a rabbi and raise our future kids Jewish. (I am a nothing by the way. Wasn’t raised with any religion.) So here’s my problem: I love Judaism at home but just can’t get into services — which are Reform. I feel like learning enough to really get it enough to even just follow along would take a lot of energy and time, and I just don’t have it in me. And it’s not the praying to God thing, because that I can deal with, but more just a feeling of being really confused and bored for an hour or two and not feeling it at all. Seesaw, is it reasonable to tell her that I just don’t think services are for me moving forward? Does that make me a bad guy? Your wife’s rationale for coming to synagogue with her more often makes sense but you are not a “bad guy” for wanting services that speak to you. 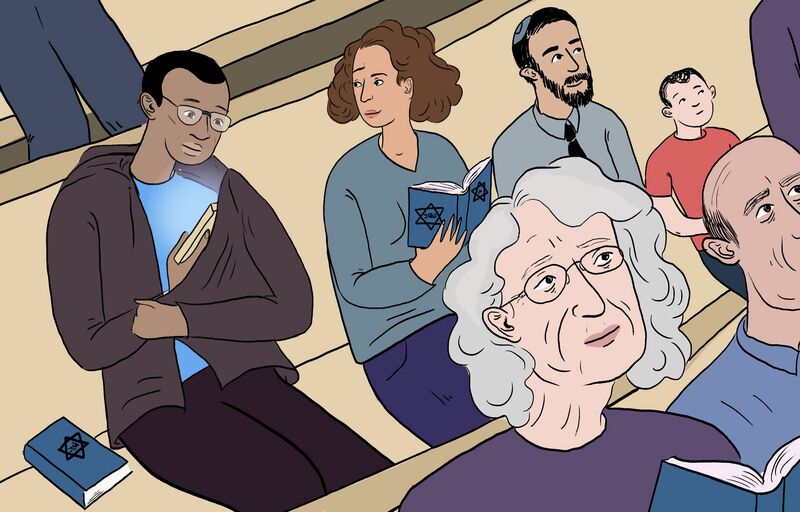 Here are a few thoughts on how to further explore synagogue life and see if you might find a way to enjoy it after all. Try to think more about the synagogue as a place of community not just a house of prayer. Consider joining the Brotherhood or volunteering to be on a committee. Meet with the rabbi to get to know him or her outside of the sanctuary. Ask the temple leadership to offer a learner’s service or crash course so that on the occasions when you attend, it feels more familiar. There are likely other members, both Jews and people of other faith or cultural backgrounds, who share similar feelings and would like services to be less confusing and more engaging. Sharing your insights could help enrich the service for everyone. If opportunities beyond thumbing your way through a prayer book do not exist at your current temple, consider moving to a different congregation or independent minyan (a lay-led worship and study community) where services can feel more interactive and stimulating. Lastly, you could wait until your children are born to attend more regularly. Having kids is the perfect opportunity for spouses of Jews, as well as Jews who were not previously exposed to Jewish education, to learn alongside one’s children. I learned more from my daughter’s early Jewish childhood education than I ever did growing up with two Jewish parents. Dr. Keren R. McGinity is the director of the Love & Tradition Institute, a nonprofit organization committed to full inclusion in the Jewish community and education about intermarriage. She is affiliated with Brandeis University and the author of “Marrying Out: Jewish Men, Intermarriage and Fatherhood”http://www.loveandtradition.com/books.html, and “Still Jewish: A History of Women and Intermarriage in America”.